Hi everyone! 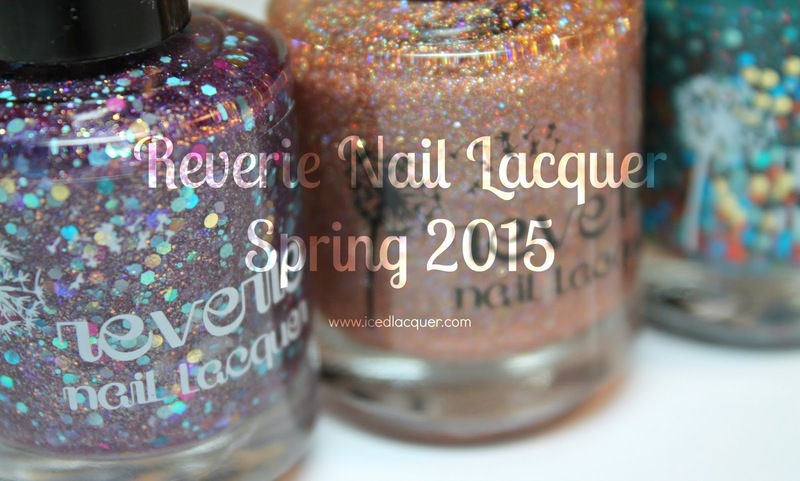 Today I have three shades from the upcoming Reverie Spring 2015 collection to share with you. The full collection features six shades and will be available on April 29th at 10:00 AM EST. Along with this collection a very limited edition shade will be launching, which you can find more details about here! "Aubergine" - A metallic plum jelly filled with a huge variety of glitters in gold, magenta, aqua, copper, grey, and even some blue/purple iridescent hexes. 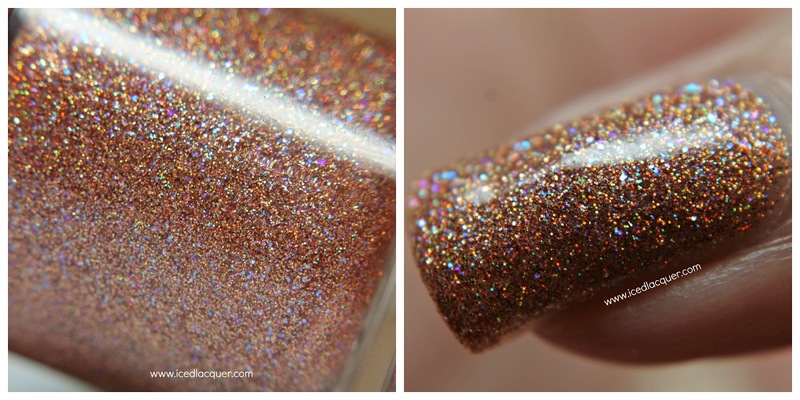 The base is also totally packed with super fine iridescent and gold flakes. This one only needed two coats plus top coat! 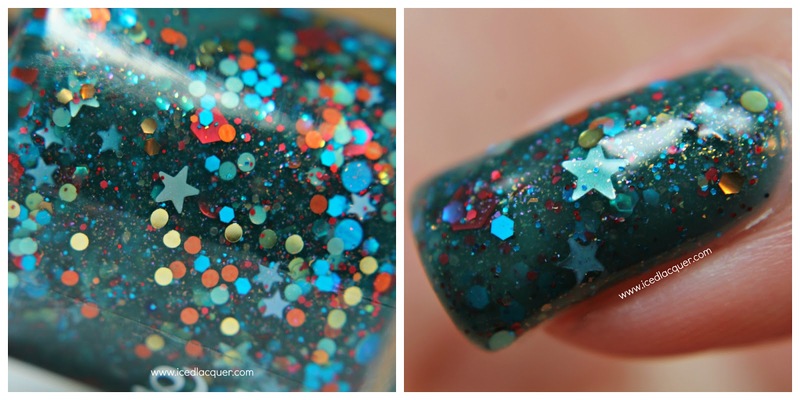 "Barnacles" - A teal green jelly base filled with red, gold and blue dot and hex glitters, large red hexes, and two sizes of blue star glitters. This one also contains tiny color shifting flakes that tend to flash between purple, pink, and gold. This is on the thinner side as far jellies go, but I had no problem building this up to opacity with three coats. This also shows one coat of top coat. "Honeycomb" - A rosey copper full coverage micro glitter and some blue/purple iridescent glitters. This one was almost entirely opaque in two coats, but I added a third thin one just for good measure. This also shows one coat of top coat. Color names: "Aubergine," "Barnacles," & "Honeycomb"
Where to buy: Reverie Etsy shop. My opinion: As I said recently, Reverie has quickly shot up my list of makers who have the most unique and amazing glitter-filled jellies. Courtney and I even interviewed Michelle this week on Nail Newscast and we talked a little bit about how she is starting to be come the jelly queen. ;) The shades from this collection are definitely on par with some of her earlier creations. "Barnacles" has just the right amount of depth and interest to it, especially with the color shifting flakes. "Aubergine" has to be one of the most interesting polishes I've ever swatched. Is it a jelly? Is it a flakie? Is it a shimmer? But wait, it's also super metallic! SO unique! Lastly there's "Honeycomb" which is a microglitter lovers dream. 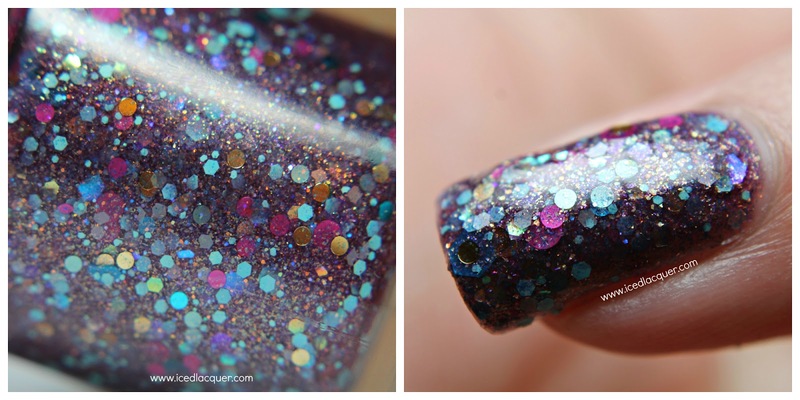 Those bits of iridescent glitters really set it apart from other microglitter polishes in my opinion. So yeah! If you're eyeing any of these shades make sure to set your alarm for 10:00 AM EST on April 29th. As always, thanks for reading!